Nineteen Sixty-four: Tracking the Catholic Vote: Too Close to Call? Tracking the Catholic Vote: Too Close to Call? With the conventions over and the debates approaching it is time to start tracking the vote of U.S. Catholics a bit more closely on the blog. The figure below aggregates the preferences of registered voters who self-identify as Catholic in national polls through last week (we'll comment on battleground state polls when preferences of Catholics are available and if you're looking for national data from previous elections you'll find it here). 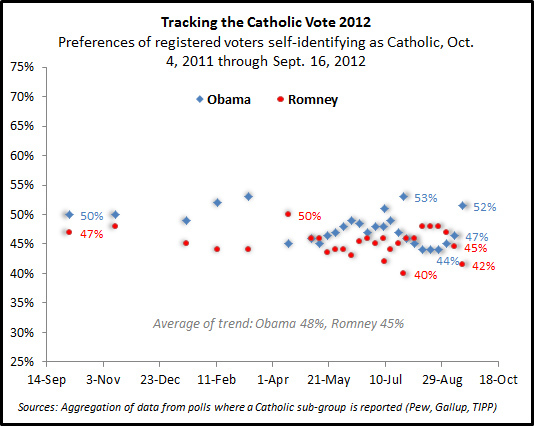 The vote of Catholics remains quite evenly split 47% for President Obama and 45% for Gov. Romney (most of the differences between the candidates have been within margins of sampling error for the sub-group). Once in March and again in July, President Obama had a lead of 9 percentage points. Gov. Romney's biggest lead was 5 percentage points in April. He also opened a 4 percentage point lead during and after the Republican Party Convention that has now disappeared. Gov. Romney has never polled lower than 42% among Catholics and President Obama's support has never measured lower than 44% among this group. Since January, President Obama has averaged 47% support among registered Catholics and Gov. Romney has averaged 46%. Rarely has either candidate measured at or above 50%. A small percentage of registered Catholics remain undecided. These are the potential voters who will likely sway the "Catholic vote" one way or the other. As it is often noted, the preferences of Catholics are often correlated with the overall popular vote (not too much of a surprise as one in four voters are Catholic). Among other religious groups, Gov. 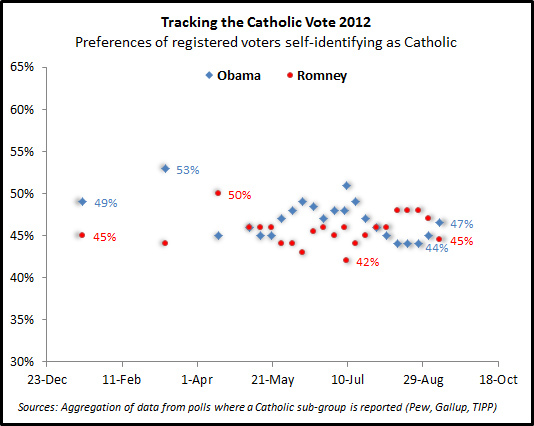 Romney holds a lead of 51% to 40% over President Obama among Protestants (on average, 52% to 40% since January). Nones (i.e., those without a religious affiliation) prefer President Obama 63% to 27% for Gov. Romney (on average, 67% to 24% since January). The next, more current, update (through Sept. 23) for the Catholic vote has been posted here.